Booties by Mary Vaneecke. Free Felt Baby Slippers pattern by Purl Soho. TheMourningProject.com is a huge community fiber art project to gather 23,000 pairs of handmade black, white, and gray baby booties. Together, these ‘little elegies’ will become part of a traveling art installation to draw attention to the problem of infant mortality in the United States. The US has the worst infant mortality rate in the developed world and loses 23,000 baby each year. After the exhibitions, wearable booties will be donated to charities. We need your help! We are asking each guild member to make TEN pairs of black, white and gray baby booties. We only need two thousand people to do this. With your participation, our 23,000 bootie goal by Mother’s Day will be within reach. You can make your submissions from any pattern with any embellishment. They are a fun, scrappy project and take little time to make. Booties can be knit, sewn, crocheted, or felted. There is no charge or jury process to participate. Click here for links to free patterns are on TheMourningProject.com website. Click here for tips on hosting a baby bootie making party. Have a question? Click here for Frequently Asked Questions or email me at mary@maryvaneecke.com. Makers should send their booties with a completed submission form (click for a link). Booties can be knit, sewn, felted, or crocheted. Make them in black, white and gray (embellishments/trim can be any color), and send them by March 15 to be a part of the first exhibition of TheMourningProject.com. Email your guild’s SEND TEN pledge total to mary@maryvaneecke.com, and your guild participation will be posted on the website. Booties accepted until Mother’s Day, May 12. Thank you for rising to meet the challenge. Click here for a PDF of the SEND TEN CHALLENGE to take to your groups and guilds. Click here to learn all the ways you can get involved. Click here for answers to Frequently Asked Questions about TheMourningProject.com. Click here to help spread the word online and in person. Click here for links to free baby bootie patterns. Click here to learn more about the problem and solutions. Click here for the Baby Bootie Permissions Form and Instructions. Click here if you want to host a baby bootie making party! Click here for a Brief Talking Points handout about infant mortality. Are you a yarn or fabric store owner? Click here. Click here if you need support in grieving the loss of a child. How many baby booties have we raised to date? Click here. Click here for a link to the GoFundMe page. Want to get updates about the Project and exhibtions? Please subscribe, and share on Facebook! For sale. Baby shoes. Never worn. This short story, attributed to Ernest Hemingway, was the first thing that came to mind when I read the headline American babies are 76 percent more likely to die in their first year than babies in other rich countries. The United States’ infant mortality rate is the highest in the developed world. That statistic shocked me. It’s a form of American exceptionalism we Americans don’t like to think about. As the Washington Post put it, Our Infant Mortality is a National Embarrassment. The loss cuts deeper because infant mortality is a problem we understand pretty clearly. The causes of infant mortality and solutions to it are well known. It is a problem other countries have solved. And it is something we have ignored. Whether sewn, knitted, felted, woven, or crocheted, I am asking for donations of handmade baby shoes in the colors of mourning: black, white, and gray. Gathered together, these small elegies will paint a picture too big to ignore. Time is of the essence–my plan is to collect 23,000 baby booties from Labor Day, 2018, until Mothers Day, May 12, 2019. If just 2,000 fellow fiberistas make just 10 pairs each, we can make the goal easily. Once these booties are collected, I will create a travelling art installation designed to advocate for policy changes that can save lives. Our work will be both a visual reminder of a national tragedy, and what we can do about it. TheMourningProject.com is a massive community art project. I can’t do this alone. Are you with me? 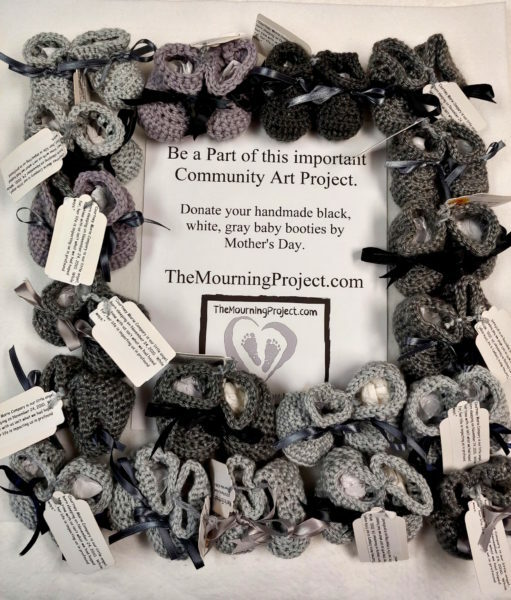 IF YOU WANT YOUR CONTRIBUTION TO BE INCLUDED IN THE FIRST EVER EXHIBITION OF THE MOURNING PROJECT, SEND YOUR BLACK, WHITE, AND GRAY BABY BOOTIES BY March 15, 2019. STAY TUNED FOR DETAILS. These booties are by Merle Eintracht in memory of Courtney Marie Campary. I have just learned of this project! I’ll do my best to send some booties out by the March date. Please put me on your email list. Wonderful news! Please help spread the word wherever you can. Thanks, Maddie! Fantastic, Karen. Sharing is just as important as making booties! Thanks so much for getting behind the project in a big way! I’m a little late in this project but I will do everything I can to make 10 booties. This is a FANTASTIC idea! I will be honored to participate. Awesome, Theresa! Thank you, and don’t forget to spread the word! Mary, I am in for making some booties! Question: Do they have to be black, white AND gray, or could they be solid colors of each? They can be any combination of black, white, and/or gray. Embellishments can be any color you wish. Thank you for being a part of this project!